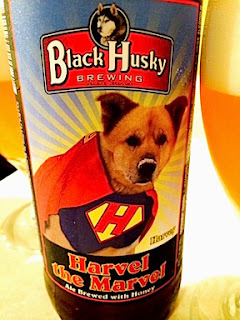 Harvel the Marvel is a strong pale ale brewed with honey from Northern Wisconsin. It pours hazy and golden sending up an enormous head of creamy, white foam. The aroma sways from toasted marshmallow to peach, orange and honey candy. The mouthfeel of this beer is incredible. It’s exceptionally soft, luxurious even. The honey flavor is prominent, but it’s not delivered with a rush of sweetness. It’s more like the slow release of sugars that you get from hard candy. The effect is odd and wonderful. The finish comes with just enough bitterness to tame the richness of the honey. For a 7.3% ABV beer, it’s surprisingly quaffable. All around, this is an excellent ale. I kept thinking of some of my favorite Belgian Tripels as I drank this, but Harvel has a much cleaner fermentation profile with none of the phenolics that tend to accompany strong, Belgian beers. This one is a breed apart. Harvel is available in the cooler section at Gardina’s on their retail side. I picked up a bottle there Wednesday for $6.99. It makes for a great companion to these cool, spring evenings. It’s been 20 years since a new brewery opened its doors in Winnebago County. Bare Bones Brewery will change that when its taproom opens Friday at 3 p.m. 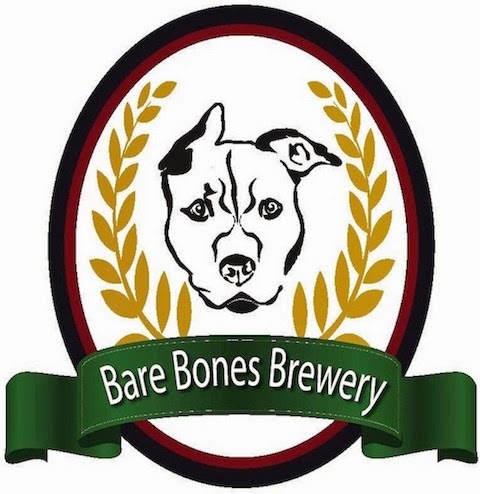 Located at the intersection of County Roads S and Y (just off the Wiouwash Trail and just over the Oshkosh city line), Bare Bones will be the first brewery to launch in this area since Fox River Brewing Company opened in 1995. But though the taproom will open, we’ll have to wait a while longer for the brewery’s beer. Bare Bones owner Dan Dringoli says he expects to have his first couple of beers ready in early July. In the meantime, he’ll have 12 guest beers pouring in the taproom that adjoins the new brewery. • Sunday 11-9 p.m., May 1-October 1. (The taproom will be closed on Sundays in Winter). And here’s the first round of beers that will be on draft in the taproom. The two beers from Tribute Brewing haven’t been on tap in the Oshkosh area before. Tribute is a small brewery in Eagle River. It was an early inspiration for Dringoli’s idea for Bare Bones. The overall emphasis on Northeastern Wisconsin beer is especially interesting. Five years ago a good portion of that list had not even existed. It’s an indication of how quickly things are changing. In addition to the beer, Bare Bones will also offer mixed drinks made with craft spirits from Pür Class Vodka (Eureka), Great Northern Vanguard Whiskey (Plover), and Door County Distillery Brandy. Sprecher and Sundrop sodas will be available as well as Village Pub Pizzas and free popcorn. There you have it. The next chapter in brewing history for our area begins this weekend. You can say you were there. For the backstory on Bare Bones Brewery, go here. The craft beer Kölsch is a rare thing. Few American breweries make this style of Northern German ale. The few that do, rarely do it well. But there’s a local Kölsch pouring at Becket’s at the moment that’s excellent. The Commuter, by Madison’s One Barrel Brewing, is just what a fine Kölsch should be. This is a pale-gold beer with a very subtle aroma that reminded me of ripe pear. It’s light-bodied presenting a grainy malt flavor followed by a mild, lemon-like hop flavor. The beer is exceptionally refreshing with a crisp finish. This was the first beer I had yesterday after an afternoon of work around the house. I was parched. It was the perfect beer for that moment. At 4.8% ABV, Commuter makes for a terrific session beer. 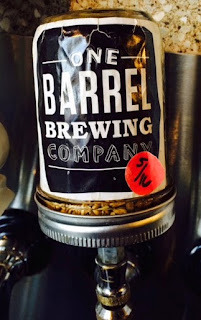 One Barrel Brewing is a nano brewery producing beer on a scale that would have seemed inconceivable not long ago. As the name implies, they do it one barrel at a time. Since launching in 2012, the brewery’s distribution has been as limited as its production. Nearly all of One Barrel’s beer is reserved for sale over the bar at it’s pub. It’s great that we’re getting a taste of this in Oshkosh. Get it while you can, I doubt this one will hang around long. When Charles Rahr left his native Wesel, Prussia in 1856 he probably thought he was leaving the atmosphere of militarism behind him. After the Napoleonic Wars of the early 1800s, Wesel became a garrison town occupied by infantry and stockpiled with artillery. The fortification of the city, kept it isolated. While the industrial revolution swept across Central Europe, Wesel stagnated. Home wasn’t the sort of place where Charles Rahr wanted to live. At 20 years old, He left Wesel to seek opportunity in America. Rahr spent his first years in America in Wisconsin working at breweries in Manitowoc and Green Bay. But five years after his arrival, Rahr found himself surrounded again by the drums of war. 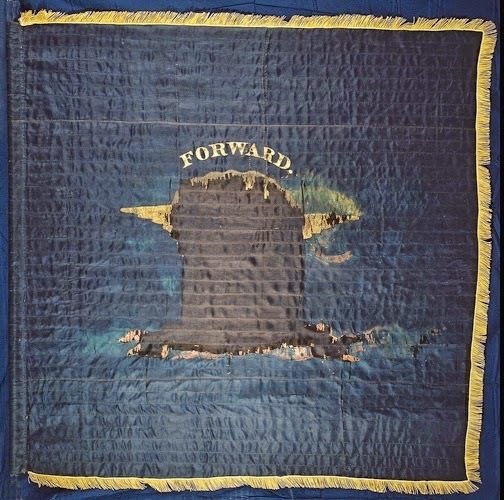 On October 21, 1861, six months after the start of the Civil War, Rahr joined the 9th Wisconsin Volunteer Infantry, a regiment primarily composed of German immigrants to Wisconsin. The 9th was sent into battle in Kansas and Oklahoma as part of what was called the Indian Expedition. 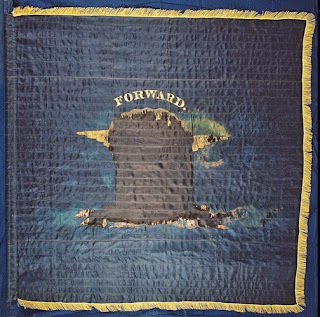 The campaign saw Union forces fighting to reclaim the territory of pro-Union Indian refugees who had been driven from their lands by the Confederate Army. Rahr served under an especially ruthless leader. Colonel William Weer kept his soldiers on half-rations and showed little regard for their safety. Nearly a quarter of those serving under Weer were casualties of war. The situation grew intolerable. Weer’s troops and officers mutinied. The habitually drunken colonel was arrested by his own men. Rahr was injured during the war. Details on this are scant, but it’s known that he was lacerated on the right side of his back. For the remainder of his life, Rahr received a $4 monthly pension for being wounded while in service. Sergeant Rahr mustered out of the Union Army in Milwaukee on December 3, 1864. From Milwaukee he travelled to Green Bay. There, Rahr married Caroline Hochgreve, the sister of a Green Bay brewer he had once worked for. 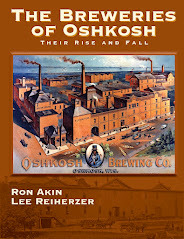 In the summer of 1865, Rahr came to Oshkosh. 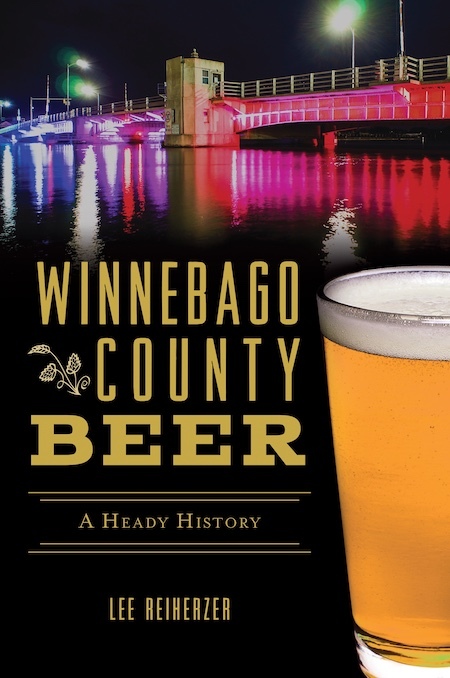 He purchased five acres of land on the shore of Lake Winnebago and went to work with his brother August building a brewery. A brewery that survived here for 91 years. 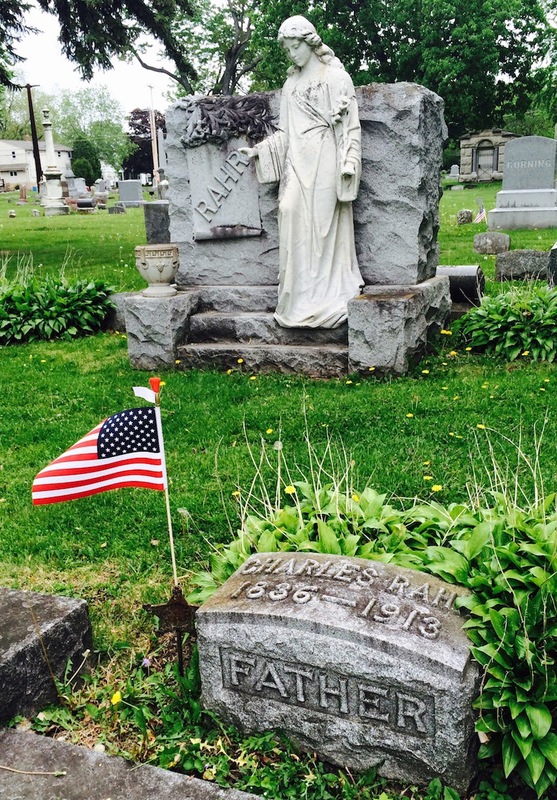 Charles Rahr died on November 30, 1913. He was buried in Oshkosh’s Riverside Cemetery. 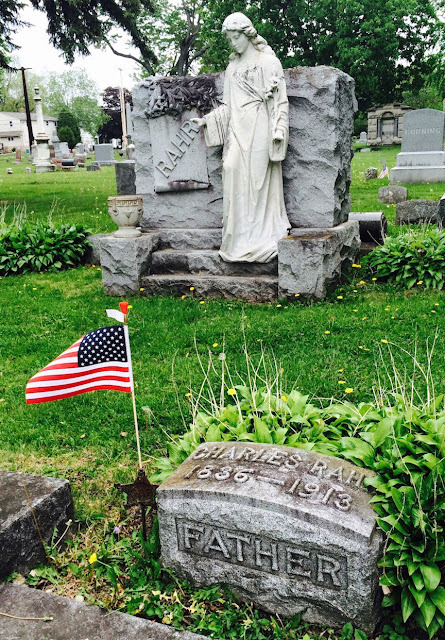 Next to his headstone is a small, tarnished marker commemorating his service in the Grand Army of the Republic. Here’s a brief overview of the history of Oshkosh’s Rahr Brewing Company. The 19th chapter of Gardina’s Beer Bar Series happens tonight with some help from Milwaukee’s Lakefront Brewing. The evening begins at 6 pm. with a cask tapping of Lakefront’s Cherry Lager cask conditioned on cocoa nibs. Along with the cask beer will be a mini tap takeover with three other Lakefront beers on draft: Growing Power Farmhouse Pale Ale, Wisconsinite Summer Weiss, and My Turn Kyle, a Belgian-style Tripel. To compliment all the beer, Gardina’s will offer a four-course dinner, pairing each of the Lakefront brews with a specially prepared dish. The dinner pairing is $30. The full menu is here. Lakefront’s co-founder Jim Klisch will also be in the house talking beer and saying hello to all the fine Oshkosh folk. For more info contact Gardina’s at (920) 231-3516. 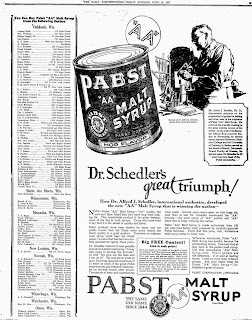 In last Monday’s post about near beer in Oshkosh, I mentioned the practice of “needling” or as it was also called “spiking.” This is where folks would take non-intoxicating near beer and inject it with alcohol in an attempt to produce something similar to real beer. The flavor couldn’t have been especially pleasant. Still, needled beer was common in Oshkosh throughout the years of Prohibition (1920-1933). 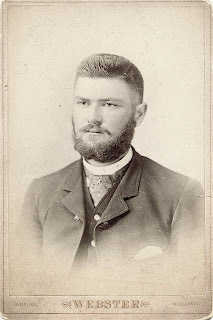 Harry E. Wiese was known in Oshkosh as a beer doctor. 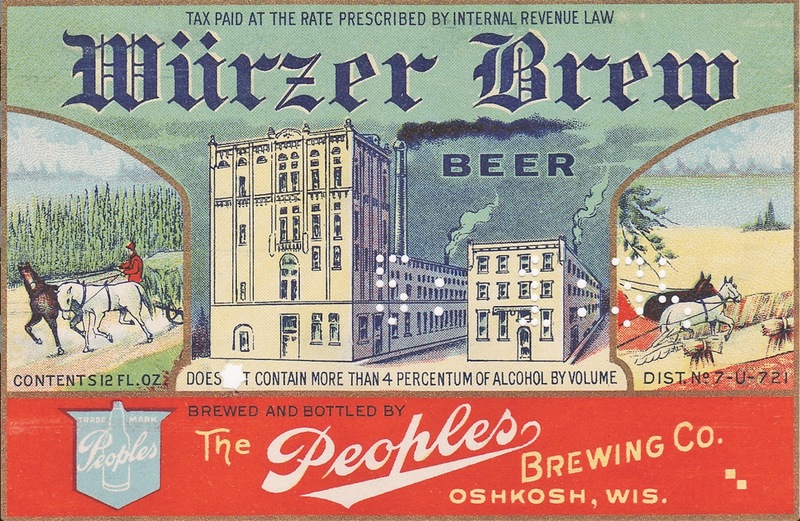 Weise would buy cases of near beer from the Oshkosh Brewing Company and Peoples Brewing. Then he’d spike each bottle with a measure of moonshine. Wiese would turn around and sell the fortified beer to Oshkosh speakeasies masquerading as soda parlors. Everyone was in on the con, from the breweries on down to the boozing end user who’d amble up to the bar and order a bottle of Peoples Bravo with a knowing wink. Wiese’s had a good racket going until he was ratted out. On January 12, 1927, Oshkosh police arrested Wiese following a complaint and subsequent raid on his home at what is now 537 12th Ave. Weise’s house still stands, by the way. They caught him red-handed. Police found 30 gallons of moonshine and a still at Weise’s home. Let’s hear the details of Weise’s operation from Oshkosh Police Chief Arthur Gabbert. Don’t you love that our top cop was referring to the illegal stuff as the "good stuff”? I do. Gabbert knew what he was talking about. During the dry years the chief was known to make his own wine. Prohibition had a way of making hypocrites out of nearly everyone other than those wholeheartedly devoted to having no fun at all. Back to Wiese. The thing most striking about him is how unremarkable he was. Though he was a criminal in the eyes of the law, he was just your average, everyday sort of Oshkosh guy. At the time of his arrest, Wiese was 37 and single (he’d get married a few years later). 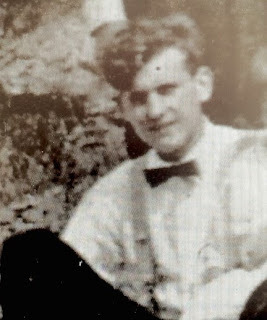 He was the son of German-born parents, had an eighth grade education and was a WWI Vet. In addition to his bootlegging he also worked a day job in the warehouse at The Buckstaff Company. He moonlit with moonshine. After his arrest, Wiese pleaded guilty and was slapped with a hefty $800 fine. That would be about $10,000 in today’s money. After paying up, Wiese went on his way. His days of crime had ended. That’s how it seemed to be in Oshkosh. As we’ve seen before with Oshkosh’s wildcat breweries (here & here), bootlegging was embedded in the community, a pastime pursued by ordinary people. Seeing your recent posts regarding the production/consumption of alcohol during prohibition in Oshkosh prompted me to remember a comment my paternal grandpa (Harold H. Gehrke, b. 1908 d. 1982) made in around 1972, when I was 14. I asked him to drop me off at an antique store on the North side of 6th st., about a block east of Oregon, so I could purchase a Chief Oshkosh beer tray. When we stopped in front of the building, he kind of chuckled and said "this place used to make bathtub gin during prohibition". I had no idea what he meant, so I asked him about it. 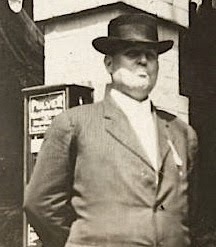 He essentially indicated that there were numerous places in Oshkosh to obtain various forms of alcohol during prohibition, and "bathtub gin" was a local favorite due to availability and cost. My grandpa drank very little when I knew him, but he did say that the gin of this era was "rotgut". My grandpa rarely talked about drinking/alcohol, so this era must have really left an impression on him. I’ll bet it did. Kind of romantic in its own way. Personally, I’m happy to forgo the romance and have beer that doesn’t need the needle. If things go according to plan, beer from Sawdust City Brewing Company will begin pouring from the taps at O'Marro's Public House this fall. The emergent brewery is the project of Mike Schlosser and Shawn O’Marro. Both are Oshkosh residents who have long been involved with the beer scene here. O’Marro via his well-known pub, O’Marro’s Public House. Schlosser through his years of involvement with the Oshkosh homebrewing community. The 40-gallon system is designed and built by Schlosser, a network engineer by trade. He’s tailored it to meet the initial concept of the brewery. The idea is to have three or four Sawdust City beers constantly on tap at O’Marro’s with an eye towards scaling the operation and distributing beer to other outlets within the city. But with a 40 gallon system, keeping up with demand at O’Marro’s pub, may turn out to be the more pressing matter. They now anticipate having the licensing process completed by late August or early September. At that point, Schlosser will begin brewing pilot batches with the intent of having beer on tap at O’Marro’s by October or November. O’Marro and Schlosser have been kicking around the idea of doing something like this for at least six years. If it comes together as planned, Sawdust City Brewing will mark the return of commercial brewing to the South Side Oshkosh after a 43 year lull. It’s a part of town where breweries flourished for much of this city’s history. The time appears ripe for that tradition to be revived. Oshkosh in the 1920s was a city crowded with outlaws. Thanks to Prohibition, criminal pursuit was rampant. The do-gooders dreamed of creating a more sober, orderly society. But their overreach inspired utter contempt for the law among otherwise ordinary citizens. The crime du jour was the production and distribution of alcohol. In Oshkosh, wildcat breweries and distilleries arrived hand-in-hand with Prohibition in 1920. Beer flats – private homes where homebrew and moonshine were sold – became common. Amidst the lawlessness, dispirited breweries like the Oshkosh Brewing Company worked within the law while abetting those who operated outside it. Here’s an ad from from October 1930 hinting at how convoluted the situation became. Tommy Thirst (“That’s Me!”) was an impish character introduced by OBC to push the brewery’s near beer in the waning years of Prohibition. There’s a line in this ad that’s perhaps more revealing than it first appears: “Our Near Beer doesn't start anything it can't finish.” That’s because the illegal “finish” was left to people outside of the brewery. OBC’s near beer contained less than 1/2 of 1% alcohol by volume. For all practical purposes, it was alcohol free. It was usually produced by taking an already fermented beer and heating it to about 173º, the boiling point of alcohol. As the beer cooked, the alcohol would be drawn off. The folks at OBC were certainly aware that their near beer would not necessarily remain an alcohol-free drink. After leaving the brewery, these brews were often spiked with alcohol to bring the beer back to its original strength or even stronger. The practice was referred to as “needling” or “spiking” and though it was illegal, it was so common in Oshkosh that the city sought to regulate it rather then try to eliminate it. The City of Oshkosh required dealers in near beer to be licensed if the beverage was being consumed on premise. In 1929, Oshkosh Corporation Counsel Lloyd D. Mitchell explained why such an ordinance was needed. The “places” Mitchell was referring to had been saloons before Prohibition. When Prohibition arrived, nearly all of these Oshkosh saloons suddenly became “soda parlors.” But only those soda parlors selling near beer were required to apply for the special license. Places like Nigl’s, Steckbauer’s, Utecht’s and Witzke’s. All the same places that OBC had been selling real beer to before the dry law. In fact, a number of them were still owned by the brewery. The licensing requirement was nearly as big a charade as the soda parlors it was invoked to regulate. An amendment to the ordinance strictly limited police enforcement of it. Only select members of the Oshkosh force were allowed to inspect soda parlors that sold near beer. The result was the continuance of local non-enforcement of the dry law here. In Oshkosh, near beer went on being “needled” beer. And Little Tommy Thirst went right on smiling. This week's Beer Beat column is up at the Oshkosh Independent. It's all about bitter beer. See it here. Amid the talk of new breweries being planned for Oshkosh, the city’s only operational brewery is gradually expanding its presence here. For the first time since the late 1990s, six-packs of Fox River Brewing Company beer are on store shelves in Oshkosh. The picture here was taken last week at the Oshkosh Festival Foods store. Festival is selling sixers Fox River’s BLÜ Bobber, a blueberry flavored fruit beer; and 2 Dams, a blonde ale. 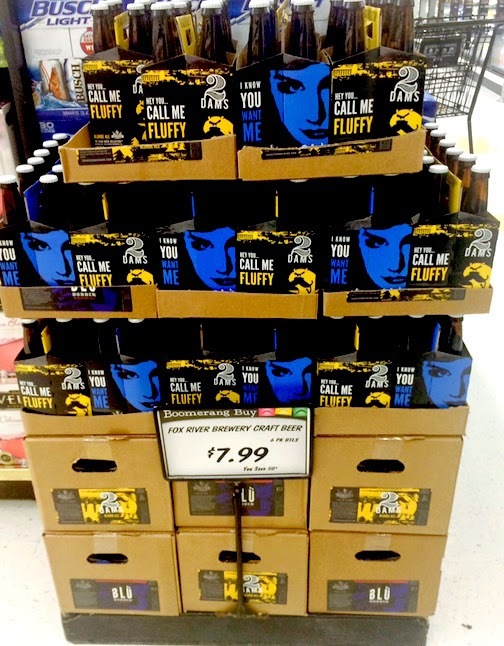 The six- packs at Festival are priced at $7.99. Both beers are part of Fox River’s Bago Brew Collection, which now includes four beers. The Bago Brews not available at Festival are the more robust beers of the quartet. Neither Marble Eye, a 6.2% ABV Scotch Ale formerly known as Caber Tossing; nor Crooked Dock, a 6.2% ABV American Pale Ale are being sold at Festival. At the moment, the store is only stocking the lower alcohol, lighter bodied beers. We’ve seen Fox River beers showing up on draft in Oshkosh for the past few months as part of the distribution plan the brewery initiated last year. Retail sales of bottled beer is the other piece of the plan. Earlier this year, Fox River installed a new bottling line at its Appleton brewpub. The bottled beer we’re seeing in Oshkosh is from that line. The increased activity at Fox River Brewing last year didn’t translate into a substantial increase in output. In 2014, Fox River Brewing produced 1,334 barrels of beer (672 bbls in Oshkosh, 662 bbls in Appleton). That’s just 15 barrels more than the brewery produced in 2013. Early numbers for this year, however, show production increasing. And the overall trend is significant. Since 2011, Fox River Brewing has increased its output by 25%. With the brewery’s beer now flowing well beyond its brewpubs, those numbers ought to continue to rise. While researching last Monday’s post about homebrew shops in Oshkosh, it struck me just how prevalent homebrewing was here during Prohibition. I’d heard stories about the boom in homebrewing here during the 1920s. But I’d never truly grasped the scale of it. This city was flooded with homebrew all through the “dry” years. The best indicator of the homebrew scene that flourished here is the number of businesses that carried homebrewing supplies. It was a highly competitive market. In addition to the two stores that specialized in outfitting homebrewers, there were shops in every quarter of the city selling ingredients specific to making beer at home. By the mid-1920s there were well over 60 stores in Oshkosh offering hopped malt extract to homebrewers. Most of these were small, neighborhood grocery stores. Many carried a variety of different extracts made to mimic pre-Prohibition beers such as Budweiser, Miller and Pabst. 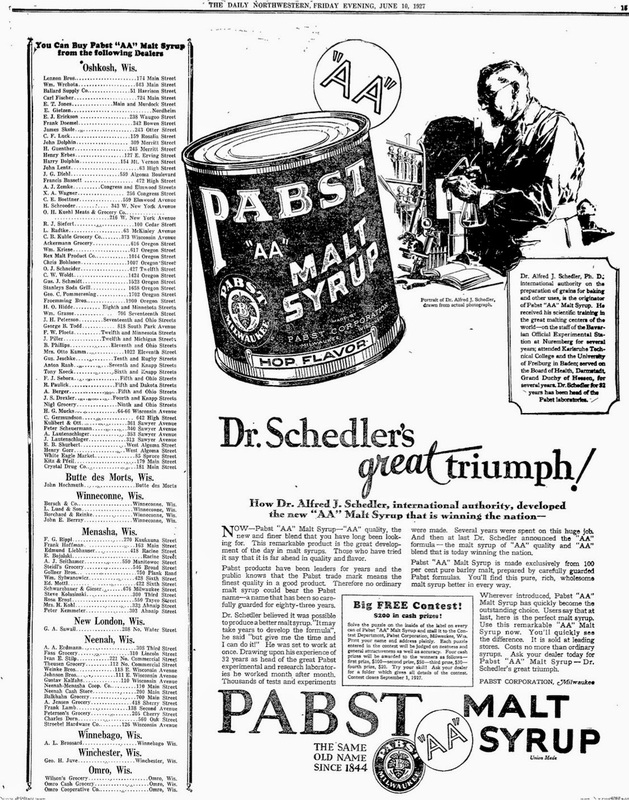 Here’s a full-page ad for Pabst malt extract that appeared in the Daily Northwestern on June 10, 1927. Notice how many retailers in the area were stocking the Pabst extract. As always, click the image to enlarge it. 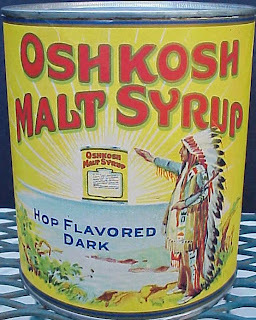 The Oshkosh Brewing Company produced several brands of hopped malt extract that were sold locally. OBC’s extract was available in grocery stores and at the brewery. Here’s a can of OBC malt extract used for brewing a dark beer. At OBC they also sold hops. And it appears that the brewery sold malted barley for homebrewers who preferred not to use extracts. That wasn’t all OBC had to offer. If you were a homebrewer with questions about making beer, what better place to get your supplies than from people whose lives had been dedicated to making beer. There’s no resource the equal of this today. In comparison to the amount of homebrew made now, the numbers from the 1920s are staggering. The American Homebrewers Association estimates that homebrewers currently produce about 2 million barrels of beer annually. In 1921, the estimates of annual homebrew production were placed at 10-11 million barrels. By 1927, the number had jumped to 35 million. That’s as much beer as was made by commercial brewers in the year after beer was legalized in 1933. It leaves me questioning why it all died off so quickly? 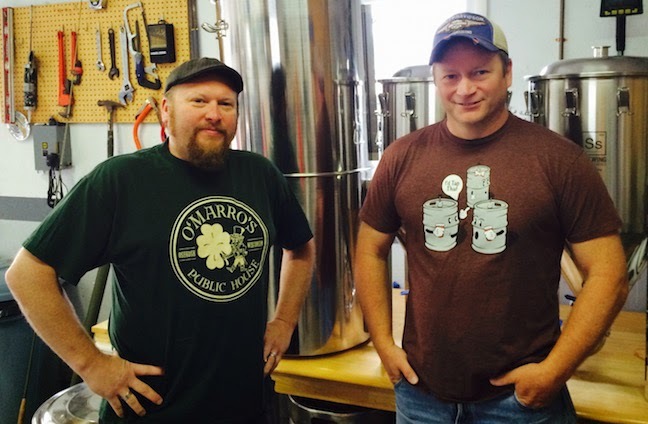 Homebrewing in Oshkosh went into a steep and immediate decline as soon as beer became legal. By the end of 1934, brewing supplies essentially disappeared from store shelves here. The preference for commercial beer over homebrew was obvious. Was the average homebrew that bad? Could be. 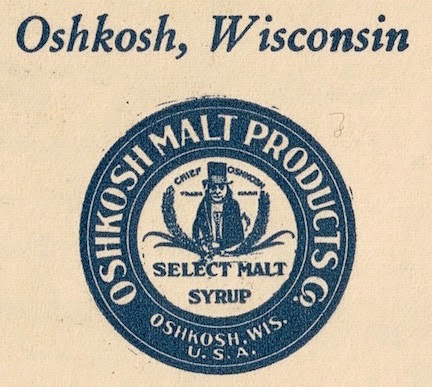 The one thing you never see in any of the 1920’s advertisements for homebrew supplies in Oshkosh is yeast. That’s telling. Sanitation along with yeast and fermentation management are crucial to producing good beer at home. Yeast appears to have been a secondary consideration for homebrewers during Prohibition. Without good yeast you won’t make good beer. Another defining character of Prohibition-era homebrew was its strength. An article from the Daily Northwestern entitled THE “HOMEBREW” FLOOD tells of the powerful beer made by homebrewers. -- Oshkosh Daily Northwestern; June, 14, 1922. That’s strong stuff, especially when compared to the pale, 4% ABV beers offered by commercial brewers here in 1933. Nevertheless, people in Oshkosh preferred it to homebrew. It would be nearly 60 years before homebrewing in Oshkosh underwent a substantial revival. Homebrewing supplies were once again being sold locally when the Society of Oshkosh Brewers formed in 1991. The hobby has continued to grow here, but in comparison to our counterparts of the 1920s we’re merely dabblers. Then again, our beer may be better. The new Oshkosh Beer Beat column is up at the Oshkosh Independent. Check it out here.